Age of Aces Books » My Most Thrilling Sky Fight: Lieut. Alan McLeod, R.F.C. My Most Thrilling Sky Fight: Lieut. Alan McLeod, R.F.C. Amidst all the great pulp thrills and features in Sky Fighters, they ran a true story feature collected by Ace Williams wherein famous War Aces would tell actual true accounts of thrilling moments in their fighting lives! This time we have Canada’s Lieutenant Alan McLeod’s most thrilling sky fight! Alan McLeod was one of the three Canadian airmen winning the coveted award of the Victoria Cross, the highest honor bestowed on its fighting heroes by the British Empire, He was the youngest flyer ever to receive the honor, having it pinned on his chest in appropriate ceremonies at Buckingham Palace a few months before his nineteenth birthday. Whereas most of the other British airmen who received this coveted honor accomplished their deeds of heroic valor in fast, single-seater fighting machines, young McLeod used a heavy, unwieldy, Armstrong-Whitworth two-seater which was poorly equipped for air combat. But Alan McLeod used it just as though it were a pursuit ship, never running from a possible chance lo shoot it out with enemy planes in the air, no matter how heavy the odds were against him. The fight he tells about below is one of the great epics of the air. 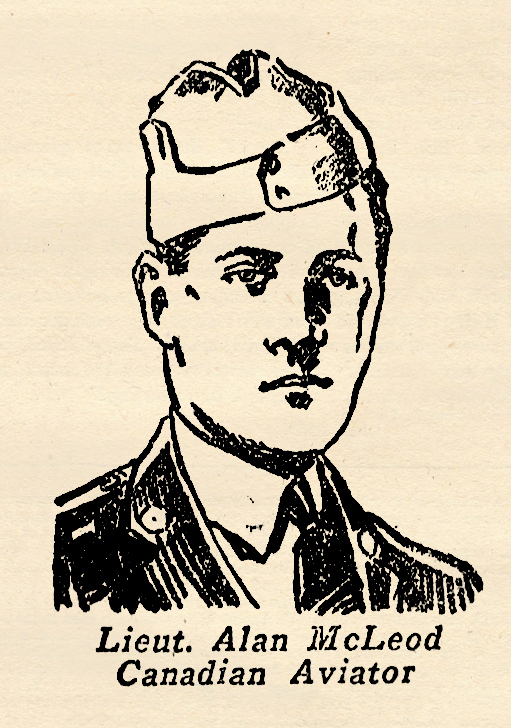 McLeod was wounded six times, but recovered, only to succumb to influenza five days before the armistice was signed. WHEN zooming up after dropping my last bomb, I saw a Hun Fokker, coming at me from the rear. I swung my machine up on one wing, gave my observer, Hammond, in the back seat, a chance at it. His first burst of Lewis fire was effective. It went fluttering down like a falling leaf, swaying from side to side. I climbed for altitude then. At 5,000 feet the sun broke through the clouds. A flight of eight scarlet-painted Fokker tripes burst through with the sun. One dived, then zoomed up under my tail. I banked steeply. Hammond got his guns on it just as the Hun let go with a burst that crackled through the lower wing just beyond my head. It went spiralling down, a black smoke trail pluming behind it. The seven other Fokker tripes dived in with a vengeance then, attacking from all sides, and simultaneously! The air was full of German tracer. My wings were sieved. Flying wires snapped, coiled up like watch springs. I felt something like a hot knife slide across my stomach. A red shape flashed down in front of me. I pressed my gun triggers, sent in a withering burst of lead that seemed to splatter like a pinwheel as it hit. More struts on my plane cracked, shattered, sheared in two from Spandau bursts. A sharp pain stabbed me in the groin. But the red Fokker went to pieces in the air, tumbled down beneath me. I glanced back. Tracer streams from two Fokkers were pouring at Hammond. One of his arms was hanging limply. Blood saturated his mitten. He was aiming his Lewis’ with the other hand. I went around in a sweeping, climbing turn, to get him above the attackers. Our plane groaned, crackled some more. More holes appeared like lightning in the upper wing, the lower. Another sharp pain stabbed through my lower right leg. A burst of German tracer found my petrol tank, it puffed into flames. I got in a final shot at a red Hun who swept across my path. He went down, out of control. The heat from the burning tank lashed back in my face. Flames, choking smoke swirled in the cockpit. I loosened my belt, stepped out on the lower left wing. Holding on with my left hand, moving the stick with my right, I threw the machine into a steep side-slip, blowing the flames and smoke away from us. Two Fokkers slid down with us, firing as they came. Hammond, weak and reeling in the back pit, got one of them just before we hit the ground, then climbed up on the top wing. The machine crashed, thudded, bounced, throwing me off. Hammond was swept back into his pit. Flames and smoke enveloped him, the whole machine. I kept going away from them until a deep blackness descended. That is all I remember.